You Better Go Now is a very pretty ballad, perhaps sung most famously by Billie Holiday. 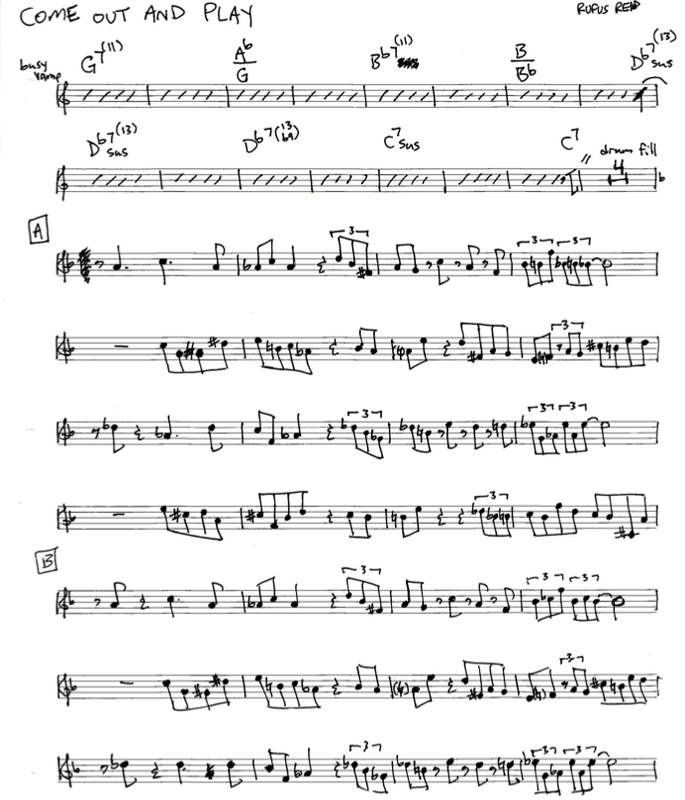 This lead sheet is based on Red Rodney’s 1957 version. 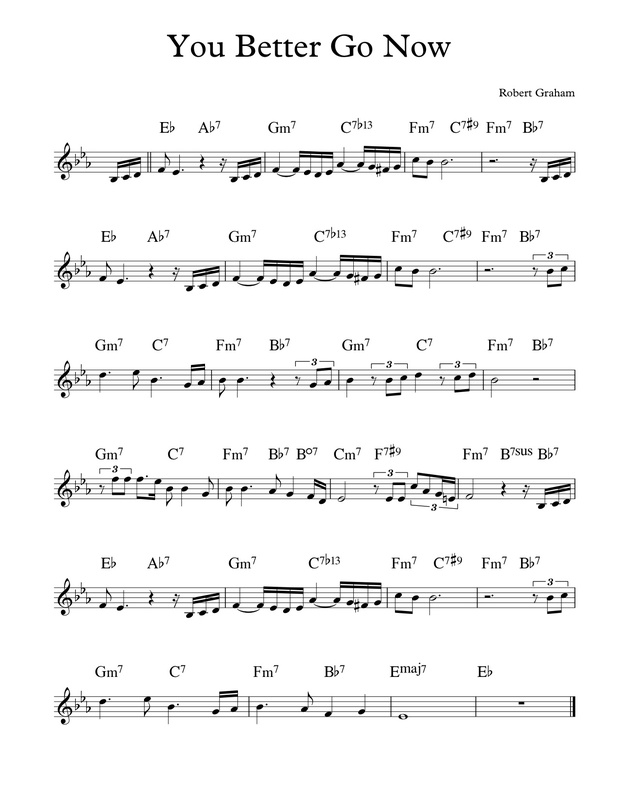 This entry was posted in Uncategorized and tagged jazz, lead sheet, music, Noteheads, Red Rodney, transcription, You Better Go Now on June 24, 2013 by noteheads. I love listening to pianist Joanne Brackeen. She has worked with a who’s who of jazz heavyweights through her 60-year career. The list of sax players alone is astounding: Teddy Edwards, Harold Land, Sonny Stitt, Sonny Red, Dexter Gordon, Stan Getz, Joe Henderson, Charles Lloyd, Joe Farrell, Dave Liebman and more. Her composing is just as hip as her playing, as shown in this short but engaging piece I heard on her 1976 album Invitation. The album features Clint Houston on bass and Billy Hart on drums. I lost or sold the CD after transcribing this a few years ago, but I played through the song on piano and it sounds much like I remember it. Corrections are welcome. 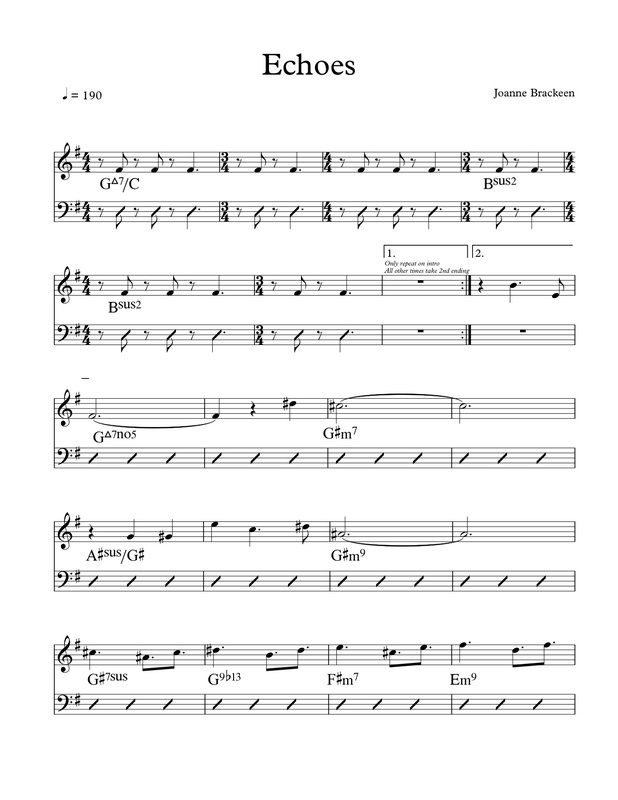 This entry was posted in Uncategorized and tagged Echoes, jazz, Joanne Brackeen, lead sheet, music, Noteheads, transcription on June 18, 2013 by noteheads. 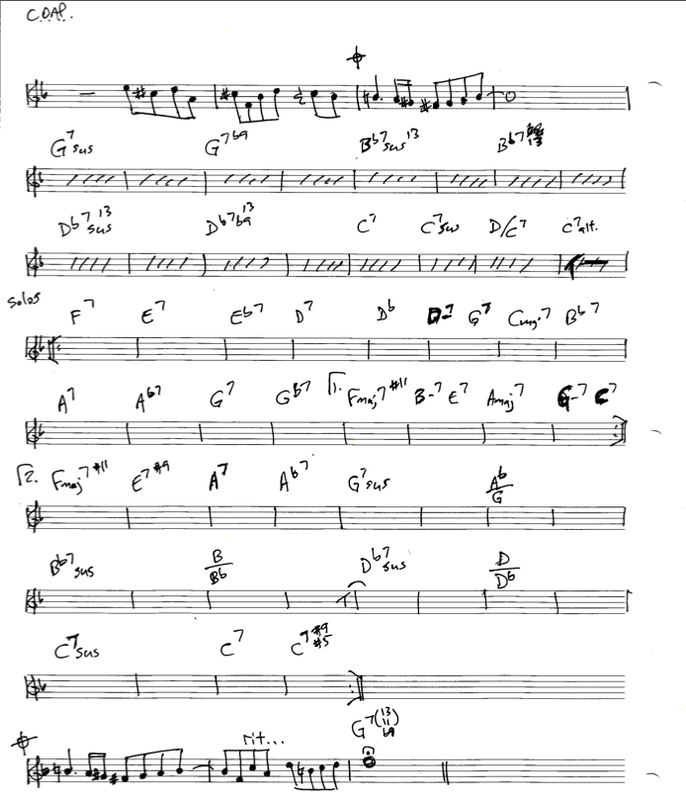 Occasionally I fill in for a friend who emcees a jazz jam session, and if I have three horn players willing to read, I like to break out this chart. I’m often surprised to hear that many of them don’t know the work of Bobby Watson. Since getting his start with Art Blakey (who also named this tune), Bobby has spent the last 30 years as a prolific player, arranger and educator. His compositions are melodic and bluesy, and many are great vehicles for players of any proficiency level. 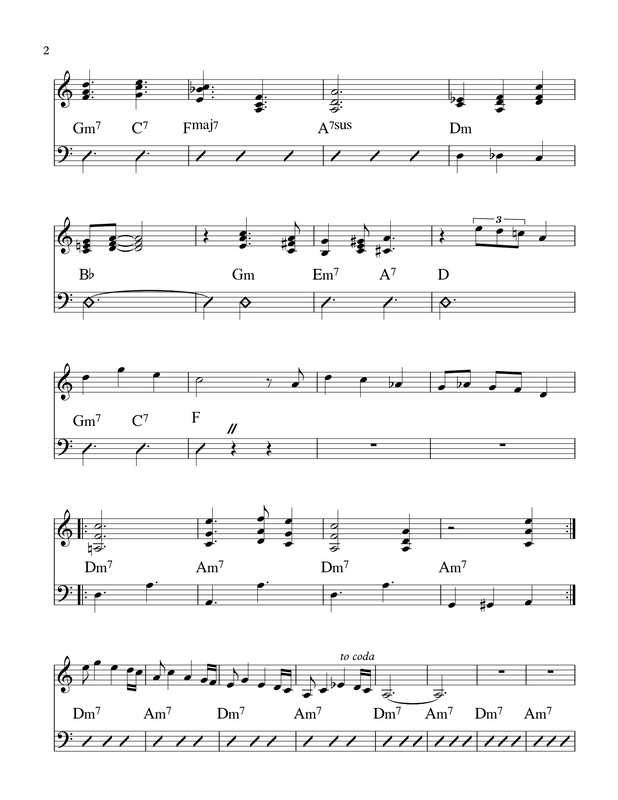 This song has special significance for me because I learned it for my first ever jazz gig (along with Wayne Shorter’s “Witch Hunt” and Freddie Hubbard’s “Red Clay”). 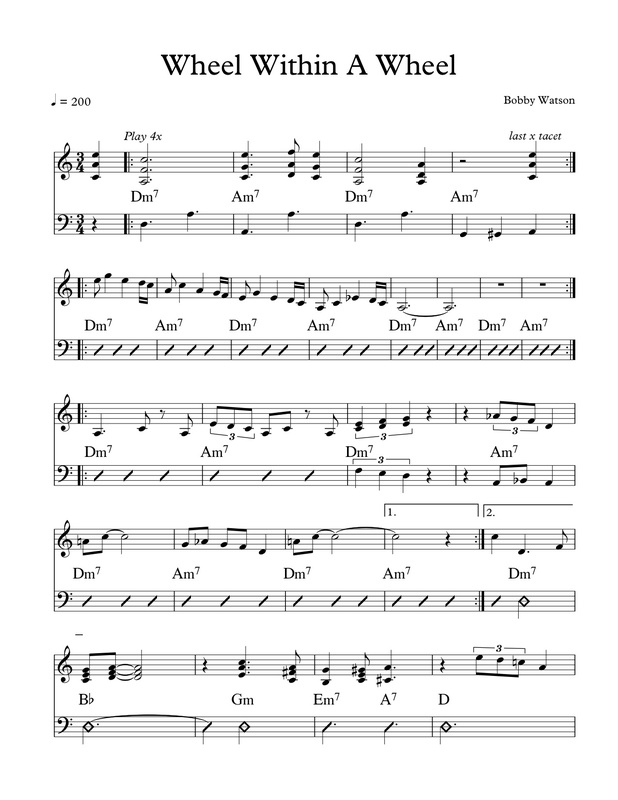 This entry was posted in Uncategorized and tagged Bobby Watson, jazz, lead sheet, music, Noteheads, transcription, Wheel Within A Wheel on June 12, 2013 by noteheads. Rufus Reid is a soulful and versatile bassist who I first heard on Album Album, an oft-overlooked record by Jack Dejohnette. He has a distinctive tone and style that has recommended him to many jazz luminaries and pop stars as well. Here is a tune of his that I like playing with a small group. It works well when everyone hits the melody together, only hinting at the changes until the solos come around. 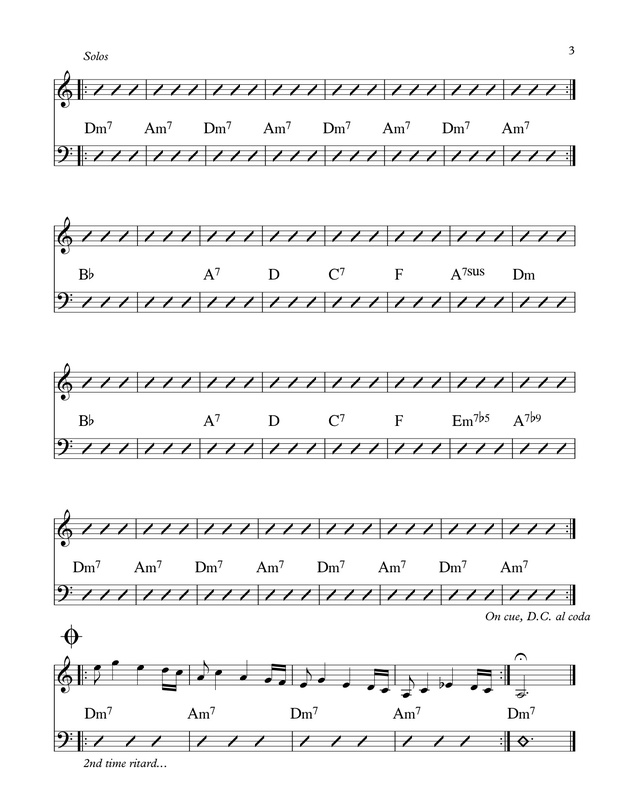 This entry was posted in Uncategorized and tagged Come Out And Play, jazz, lead sheet, music, Noteheads, Rufus Reid, transcription on June 5, 2013 by noteheads.